Time for Go-to-Galz Challenge over at Cardz TV. It's all about Summers Harvest!!! From fruits to pumpkins, flowers to beans, if it grows in the summer and you can harvest it, this challenge is for you! 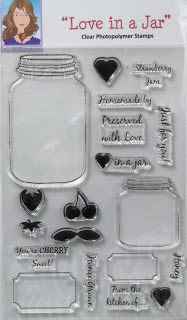 Cherries are what I selected accompanied with Mary's stamp, and a little masking, ta da, it was just what I wanted! I hope you enjoy my card, make sure you head over to Cardz TV to check out my DT Sisters and join in on the challenge! Love this Melissa! The details rock! Cute, cute, cute! Great minds think alike, we both chose yummy cherries for our cards. Love that gingham ribbon. I just love this card! You added so much dimension and shading with your different colors - gorgeous! Great job on this weeks challenge! So sweet! Love the colors.